If you desire clean and tastefully decorated accommodations look no further. Enjoy this spacious oceanfront condo with breath taking ocean views. You are within steps of sinking your toes in the sand. 'Sugar Beach' is the longest stretch of beach on Maui . Grab a drink, relax on the lanai, take in the ocean views and enjoy the tradewinds. 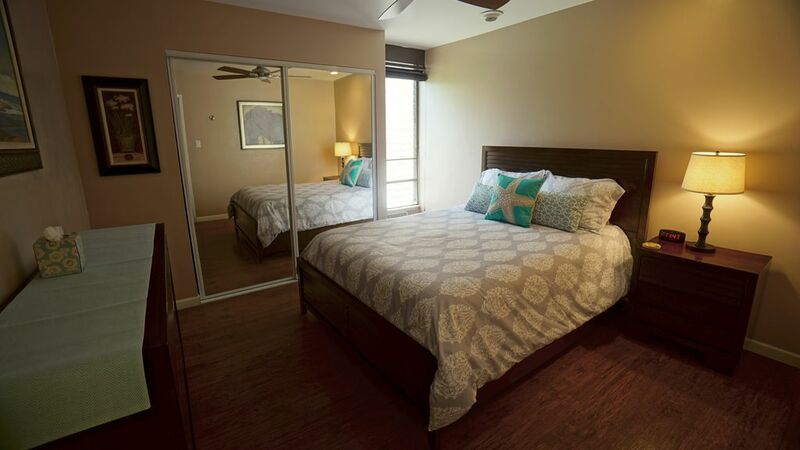 The newly remodeled master bedroom boasts a brand new Queen bed set, ceiling fan, A/C, and all new furnishings. Enjoy the second bedroom including an all new bed set, ceiling fan, and all new linens. The private swimming pool and jacuzzi are pristine clean and the area provides plenty of lounge chairs to relax and enjoy the sun. Clean, clean, clean!!!!! We pride ourselves in providing clean and comfortable accommodations for our guests. Beach time- provided are beach chairs, towels, cooler and umbrella for your convenience. We provide laundry soap, toiletries, and so much more. Great condo in a great location!! Very well equipped property. Everything you need to enjoy relaxing times in Maui. Wake up to views of ocean and mountains, then stroll across the street to Sugar Beach where you can walk 4 miles along the ocean. Return to hot tub/pool/whatever else the day may bring. Your two bedroom condo was lovely! It was very clean and had all the amenities of home! Mahalo! We loved this location! A beautiful spot to watch the whales every morning from the lanai! Close to grocery stores, shops, and restaurants! We loved the Old Lahaina Luau! Thanks to your friend Corina for being our Uber driver! You have to make sure to see the Banyan tree when there! Unfortunately, we had some very unusual inclement weather while in Maui... locals said they hadn't seen weather like that in the years they have been living on the island. So, two of our excursions got cancelled (Road to Hana and Sunrise bike tour on Haleakala). But, would recommend to other travelers to do both because of the great reviews and sights to be seen! Thank you again for opening your home to us! energetically and estetically praceful. It was perfect for our needs while biaitong Maui and we would retuen and secure this same rental again. Yhis tental truly helped shape our expeience in Maui! The unit was clean and had everything we needed. The lawn chairs and cooler bags were a nice bonus. Nice and cool with air conditioners in each room. Nice and easy beach access. Overall we were very impressed with this unit. Unit was clean and well stocked. Plenty of room for a family of 4. The TV in the second bedroom was great for the kids. The ocean views are better than anticipated. Location is fantastic across the street from a good beach. The pool area is nice and you don't feel as if you are intruding as we have at other complexes. We would definitely recommend this unit! clean, newly refurbished, had everything we needed - & RIGHT across from a beautiful beach! We were very happy with our stay at this property! It was very clean, had clearly been revamped in recent years, had everything we needed, and served us very well for our 6 night stay. We could see the ocean (past the parking lot, but who cares) from the little balcony; there were beautiful Hawaiian flowers throughout the complex; everything worked fine; and, best of all, we were just steps away from a sweet little beach. We returned to the beach every single evening to watch the sunset, swim, let our daughter explore some rocks/ tidepools, dig in the sand, etc. We also saw a cute young humpback whale breaching flirtily out to shore one morning! We would definitely, happily stay here again.